What should U-M medical researchers study next? You can help decide. The U-M wants your ideas for what its medical researchers should study. You can also lend your voice to ideas suggested by other members of the public and help them gain steam. 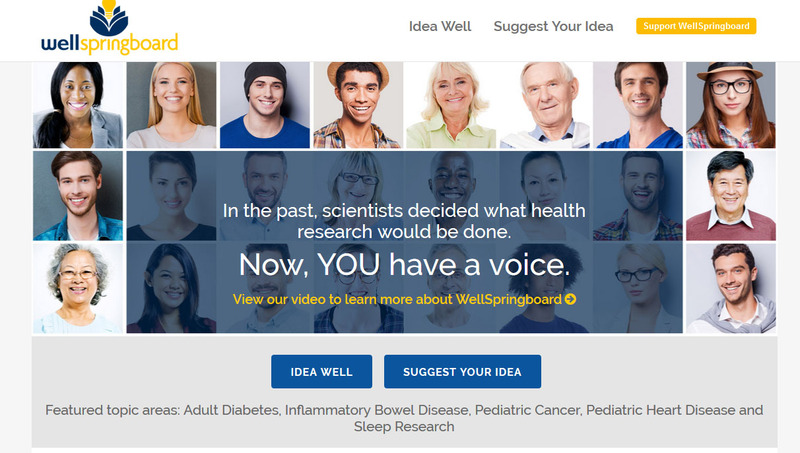 U-M recently launched WellSpringboard.org as a crowdsourcing and crowdfunding platform for medical research at the U-M Health System. They’re especially seeking ideas for studying how medical care affects patients now, and how to improve care. Every penny raised will go to U-M research. inflammatory bowel diseases such as Crohn’s and colitis. Davis, also a professor of pediatrics and internal medicine, worked with a team at the Michigan Institute for Clinical & Health Research, or MICHR, and the U-M Medical School to develop the platform. The WellSpringboard idea received national awards from the federal Patient-Centered Outcomes Research Institute in its concept stage. Now, with support from MICHR, WellSpringboard is fully developed and ready to go. Already, several patients have contributed videos and short statements calling for research on topics they care about. On the website, people can vote for ideas they think should be a focus of research. U-M researchers often get their study ideas from what they see when treating patients, as many are also doctors at the U-M Health System or work with doctors, Davis notes. But getting ideas — and donations of all sizes — from patients, families and the general public may mean even greater insights into what patients really want researchers to solve. “We hope that the innovative combination of crowdsourcing research ideas, and crowdfunding the ones that researchers agree to study, will prove successful and be a model for other academic medical centers and research institutes,” Davis says. He is a professor of pediatrics and internal medicine at the U-M Medical School, and a member of the U-M School of Public Health, Ford School of Public Policy and Institute for Healthcare Policy and Innovation. Visit www.wellspringboard.org to submit an idea, vote for one, or donate.